The book records the most crucial events in Indian history covering a span of 50 years from beginning of India’s freedom movement against British rule to the regimes of Jawaharlal Nehru and Indira Gandhi. India’s third President Dr. Zakir Hussain wrote the foreword for Durga Das’ seminal book and described it as “Indian history seen from the inside.” The book was released by India’s fourth President, V.V. Giri, in 1969 who described it as a must for any one wanting to understand free India. The book was published in 1969 by Collins in Britain and John Day in the United States. 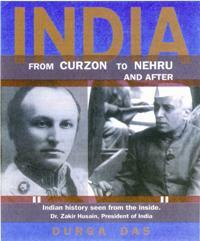 Rupa of India subsequently published the book both in paper back and hard cover. It has also brought out a paper back edition in Hindi. Who conceded Pakistan? Some name one person, some the other. But, in point of fact, there is no simple, straight answer.Both the Congress and the Raj for their own reasons were keen on maintaining a united India, both were walking the slippery path of winning the support of the third side of India’s power triangle: Muslims. Whitehall unconsciously first planted the seed of partition by conceding separate electorate and communal representation, in Minto’s words, to the Muslim “nation.” …. Nehru had his own plans for his daughter – plans which some of us clearly discerned. That was the first time when people at home and abroad had started asking: “After Nehru, who?” All manner of guesses were being made. However, few realised then that Nehru was, in point of fact, building up Indu, as he affectionately called her, to carry forward the Nehru legend for the third successive generation. It was not without reason that he had welcome her idea of retaining use of her maiden name after marriage to Feroz Gandhi and calling herself Indira Nehru-Gandhi…..
Twenty-first October, 1962 marked a turning point in the Nehru era. That was the day China launched its wanton aggression against India. Not many days afterwards, our Armed Forces in N.E.F.A. were routed and India’s national pride suffered its worst humiliation since independence. What went wrong? How did our officers and jawans, who had earned fame in World War I and II as one of the finest fighting men, suddenly come a cropper? Who were the guilty men and did they get their deserts? These and other questions have been asked again and again and sought to be answered by Government leaders, retired generals, military experts and journalists. The story of the debacle has been told only partially. Not all the guilty men have been named….